There are pockets in the world where people live longer. Not just a little longer, but many years past the average life expectancy. In fact, in some of these places, people have three times the chance of living to 100 than Americans do. Ouch. And they aren't warehoused in a nursing home or confined to a wheelchair. They are still active, engaged in life, and happy. They enjoy living and prefer it to the alternative. I certainly don't want to be an old creaker, sitting in a diaper while somebody feeds me warmed-over pablum. But if I could live to 90 or beyond and still be healthy, happy, and active, would I want to? You bet. And I bet you would too. So what do these centenarians have that we don't? The good news is that genetics doesn't have much to do with their longevity. But lifestyle does. And lifestyle can be emulated. So if you have any interest in cutting the rug on your 100th birthday, I'm about to give you the scoop on living longer and better.
. The Blue Zones are the areas in the world where researchers have found the world's longest-lived people. The author of the book, Dan Buettner (working in conjunction with the National Institute on Aging) researched and reports on four of these Blue Zones in the book. At first blush, you might wonder what any of these places have in common. The people and cultures couldn't be more disparate. But once you understand their lifestyles, you will recognize several lifestyle choices that the people of these places have in common. Diet: Sardinians have a diet which consists of whole-grain bread, beans, garden vegetables, fruits, and pecorino chees (made from grass-fed sheep and high in omega-3 fatty acids). Meat consumption is infrequent, reserved for Sundays or special occasions. They also drink goat's milk, which has components that help protect against inflammatory diseases. They drink red wine regularly, but moderately. Activity: Sardinia is a sheep-herding culture. Sardinian men walk five or more miles a day over hilly terrain. Women are more sedentary, but it is still a walking community. Unlike those in some of the other Blue Zones, men in Sardinia have a life expectancy as high as women. Family: Sardinians have strong family values and make sure every member of the family is cared for. Elders are respected and celebrated. Grandparents play an important role in the family, providing childcare, wisdom, financial help, and ties to traditions. Outlook: Men in Sardinia are known for their sardonic sense of humor. They meet in the afternoons to socialize and laugh with and at each other. Diet: Okinawans eat a plant-based diet consisting of stir-fried vegetables, sweet potatoes, tofu and other soy-based foods. They also eat goya, a bitter melon high in antioxidants. They grow mugwort, ginger, and tumeric (known to have medicinal qualities) and consume them daily. Okinawans do eat some pork, but in very small quantities and only for special occasions.They practice hara hachi bu — eating until you are 80% full. Activity: Older Okinawans regularly walk and garden. Gardening exercises the entire body and helps reduce stress. They take their meals sitting on floor mats and get up and down off the floor many times daily. Purpose: Okinawans embrace “ikigai” — a purpose for living, which they can readily articulate. They have clear roles of being needed and responsibility well into their senior years. 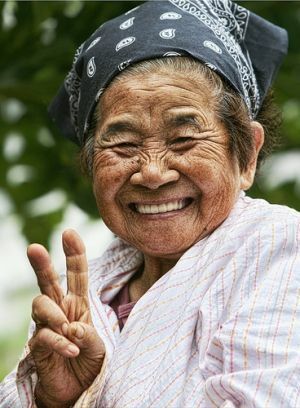 Outlook: Although many older Okinawans suffered hardships in their younger years, they are able to live in the now and enjoy the simple pleasures of life. They enjoy keeping younger people in their company and have a general affability about life. Diet: Loma Linda is home for America's largest population of Seventh-Day Adventists whose faith discourages meat consumption, as well as rich food, caffeinated drinks, and alcohol. They eat a plant-based diet, as well as whole grains, plenty of nuts, and lots of water. They also eat early and light for dinner. Activity: The Adventists get regular low-intensity activity like walking and moderate exercise. Diet and exercise helps them keep a low body mass index. Purpose and Faith: Adventists encourage members to volunteer, which they do well into old age. It provides opportunities for socializing and gives a sense of purpose. They also take a weekly 24-hour break for the Sabbath when they focus on God, family, friends, and nature. Community: Adventists spend most of their time with other Adventists who share their values and support one another in times of need. Diet: A staple of the Costa Rican diet is tortillas. They also eat beans, rice, a variety of fruits (especially oranges) and vegetables. Their diet is rich in complex carbohydrates, protein, calcium, and niacin. They eat small amounts of meat and eggs. It is common to eat a very light dinner. The water in some parts of Costa Rica is calcium rich, and they consume a lot of it. Activity: Physical work is part of daily life, even for the elderly. They find pleasure in everyday physical chores. Purpose: As with the other Blue Zone residents, Costa Rican elderly have a strong sense of purpose and place within the community. They have community traditions that have protected them from stress. Family: Family is hugely important to Costa Ricans, and the elderly tend to live with their families, where children and grandchildren provide a sense of support and purpose. Most of you reading this do not live in one of the Blue Zones. In fact, if you live in the U.S., you can easily recognize that the average American lifestyle doesn't reflect what you've just read about the Blue Zones. We have diets high in fats, sugar, meat, processed foods, and sodas. We are sedentary, stressed, over-worked, and disconnected. Even if you are living a healthier than average lifestyle, the message from the Blue Zones is that there is more we can do to live longer and healthier. Dan Buettner has distilled the lifestyle principles of each Blue Zone into nine lessons that you can follow to improve your changes of dancing on your 100th birthday. You don't have to run marathons or take spinning class to stay fit. Moderate level exercise that is sustainable is the best form. There are small changes you can make to do this by inconveniencing yourself — park farther away, take the stairs, walk instead of driving. Do fun activities that involve physical movement, like biking or gardening. Stop eating when your stomach is 80% full. Caloric restriction has been shown to prolong life in laboratory animals and is associated with better heart health in humans. To help you stay away from extra helpings, put food away before you take your plate to the table so you aren't tempted. Use smaller plates and glasses. Eat more slowly while sitting down. Eat early — make breakfast the biggest meal of the day. Eat four to six servings of vegetables a day, and limit meat intake to twice weekly (with a portion the size of a deck of cards). Make beans the staple of your diet, and eat nuts every day. Eat fruit for your sweet tooth. A daily glass or two of red wine is associated with lower rates of heart disease, as well as help reduce stress and the damaging effects of chronic inflammation. It also may help fight arteriosclerosis. But stick with just a drink or two as over-consumption negates the health benefits. Having a sense of purpose reduces stress and reduces the risk of Alzheimer's disease, arthritis, and stroke. Researchers have found a direct correlation between having a sense of purpose and longevity. Purpose can come from parenting, grand-parenting, a job, volunteering, or a hobby. Learning a new skill can also provide that sense of purpose. Find something you feel passionate about or at least highly engaged in and take action. All of the Blue Zone residents practice some form of stress reduction both through socializing and relaxation. They take breaks during the day to spend time with friends and family. They take a “sanctuary in time” to disengage from the daily pressures of living. Too much stress causes chronic inflammation which can build up in the body to contribute to age-related conditions like Alzheimer's, diabetes, and cardiovascular disease. Find ways to disconnect from noise, distractions, overwork, over-scheduling, and rushing. All of the Blue Zone centenarians were part of a faith community. Sardinians and Costa Ricans are Catholic. The Loma Linda residents are Adventists. Okinawans have a blended religion celebrating ancestor worship. Regardless of your faith, the act of worship is a habit that seems to extend your years. In fact a recent study revealed that those who attended religious services once a month reduced their chance of death by a third. Even if you are a non-believer, going to some kind of service that is not based on strict dogma will be beneficial. The healthiest and most successful centenarians in the Blue Zones built their lives around their families. Family traditions and togetherness were vitally important. These practices teach their children and grandchildren the value of family which is passed on through generations. Americans tend to be more individualistic, but working toward bringing your family closer in small ways can extend your life. Create rituals and traditions in your home. Have family meals together. Keep extended family involved in your life. Surround yourself with people who share your lifestyle values so that you can support and encourage one another. This is easy for the Blue Zone residents because their entire communities are built around these lifestyle traditions. But you will need to make an effort at it. Create an “inner circle” of like-minded people with whom you spend regular time. Build strong friendships that can last a lifetime, and you will extend your lifetime. Would you like to live to be 100 if you are healthy, active, and happy? To find out your life expectancy based on your current habits, check out this assessment. Great post, Barrie! Just ordered Blue Zone, too, after seeing a documentary on the Okinawan community. I was so impressed by an elderly woman who climbs trees every day to pick fruit! I can’t even climb a tree now! 🙂 It is really inspiring to see how just a few lifestyle changes can make such a difference. I have always believed that our choices and actions determine the kind of lives we lead. It is good to know that by managing our lifestyle well, we can live happier, healthier and longer lives. I love the lessons that Dan Beuttner has put together to show us how to have better lifestyles. The following stand out for me. I used to be greedy when I was younger, but nowadays I rarely eat until I am full. In fact, when people meet me, they always comment that I have lost weight. In truth, I eat to live. Food doesn’t really interest me that much and I certainly will not go out of my way just to eat something nice. Thus, practicing hara hachi bu comes easily enough to me. That said, I could eat less meat. I think having a reason to wake up each morning is very important. A purposeless life is hardly worth living. Ever since I read Viktor Frankl’s Man’s Search for Meaning years ago, I have come to realize the importance of purpose. If possible, we should all have an all consuming purpose to fuel us each day. And yes, a purpose is essential. If you have a reason to live, you are going to keep living! I read the book (The Blue Zones) a few years ago and found it hugely inspiring. I’m so glad you liked it. Are you practicing the Blue Zone lifestyle?? Great information, Barrie. Thank you for sharing and breaking it down into actionable items! You are so welcome Marcia! Very thorough, thanks! We get proofs of what works. I love the 80% full method. Mary, thank you so much for sharing this with your readers. I really appreciate your kind words! That’s great David. Make the most of them!! You are so welcome. I’m glad you liked it. Barrie, I was blessed to be raised with ALL of the practices you name here, except for the meat part because we are cattle farmers! But I have not been eating very much meat at all, only fish, for decades now. My grandmother walked 3/4 of a mile the evening before she passed at the age of 102-and she lived this way! Bless you for providing so much help to so many here. Rose that is amazing! She must have been a real inspiration to you. So much of this comes naturally for you — that is great. For some these are very difficult lifestyle changes. Great stuff here, Barrie! We all want to live long and healthy. But too few people are willing to discover how and fewer still to actually put it all into practice. You’ve distilled some great lessons from around the world into a powerful information-packed motivational article to help us live more healthy to be able to keep dancing well into our golden years. Thank you for that! You are welcome Ken. I wish I could claim the kudos for pulling all of the info together, but the author of The Blue Zones did all of the hard work. 🙂 But it was so fascinating to me, I just had to share it. Thank you for this wonderful post. I live in a country where in most areas, a persons well-being (financially and health-wise) is determined by the size of heir waist and belly fat- the wider and bigger the more successful and healthy you are supposedly. For many people, as they move up the social ladder, the more they disregard whole grain products and instead consume more and more refined foods and meat. Sugarless tea or products are associated with the poor. The results are an alarming explosion of lifestyle diseases that until recently were unknown to the local people. Diabetes, hypertension, heart disease and other chronic illnesses including obesity and ED are on the rise among those in their thirties. I believe we all could take note of the Blue Zone and emulate their lifestyle. All is not lost.